Within Logic Apps there exits an Integration Account, part of the Logic Apps Enterprise Integration Pack (EIP), that can store maps generated by the BizTalk mapper (viz. XSLT). These maps can then be used in a Logic App XML Transform action to perform message translation. The focus of this article is to highlight possible issues that may arise when a BizTalk map is migrated to Logic Apps and how these issues can be overcome. This article also considers the migration of a BizTalk map to Logic Apps when either the XML Transform action cannot be used or when no Integration Account is available. It should be remembered that the BizTalk mapper designer tool does not simply provide translation, it allows the implementation of specific integration patterns (e.g. message aggregator and message splitter) which also need to be taken into consideration. The map cannot be migrated and a solution other than using the Logic App's XML Transform action is required. This would include those maps that use database functoids, custom functoids, and make calls to external assemblies. Finally, there is also a brief consideration of mapping done within BizTalk which does not make use of the BizTalk mapper (i.e. in a pipeline or orchestration) , for example, by serializing/de-serializing to and from .NET classes or by using a third-party XSLT translator. This article assumes the reader has a basic knowledge of Azure Logic Apps, Logic Apps Enterprise Integration Pack, Logic Apps XML Transform action, BizTalk Server mapper designer tool, C#, XML, XSLT, and familiarity with Microsoft Visual Studio. The Logic Apps EIP can be used to store the XSLT of a map generated by the BizTalk mapper. The process of generating the XSLT of a BizTalk map is straight forward: in Visual Studio right-click on the map in the Solution Explorer window, select validate map, and the XSLT file location will appear in the Output window. The file can then be uploaded to the Integration Account. This is basic BizTalk mapper knowledge so there is no need to dive in deeper and anyone requiring further information can find numerous examples online. A BizTalk map that does not make use for database functoids, custom functoids, and make no calls to external assemblies using the Scripting functoid will migrate to Logic Apps and the XML Transform action without any issues. At present there in one exception to this. The Logic App XML Transform action output must be XML, if it is not the map will fail. So, if a map with an XSLT template in a scripting functoid is used to generate non-XML output it will fail with the exception: “InternalServerError. The 'Xslt' action failed with error code 'InternalServerError'.” As of 6th June 2017 Microsoft have acknowledged this limitation and stated that they are working to address this. If the BizTalk map cannot be migrated ‘as is’ it will be because it fits into either category 2 or 3 explained in the introduction. In the following sections each migration issue is discussed and a solution provided. In some cases alternative solutions are given. Problem: If a BizTalk map has multiple source messages. Solution: Manually build the envelope message from the multiple source messages. This first solution to passing multiple source messages simply involves building an ‘envelope’ message similar to that above for the input messages. 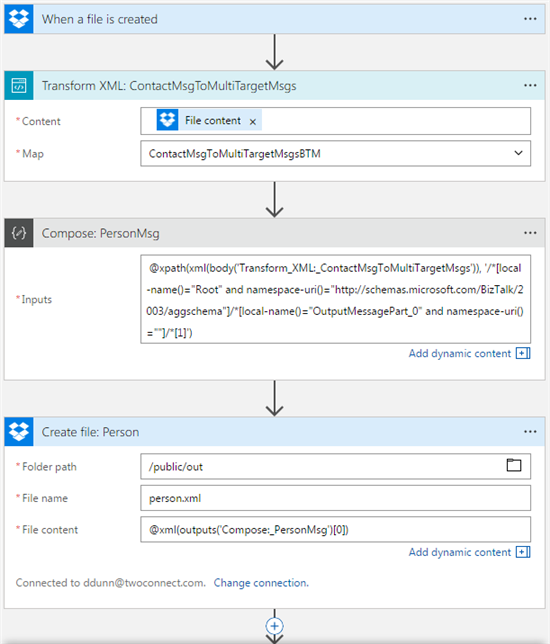 The Transform XML action will concatenate both the ‘envelope’ elements and source messages and pass the content as a single source message to the XSLT processor. Pros: Simple to implement. The BizTalk XSLT map requires no changes. Cons: Looks untidy and difficult to edit in the Logic App design view. Solution: Pass each source message as an XSLT parameter. Convert each parameter value to an XPathModeIterator object and store it in an XSLT variable with the same name as the corresponding ‘envelope’ input message node. Update each XPath query to use the appropriate XSLT variable. Perform a search and replace with the XSLT to add a ‘$’ character to the beginning of the xsl:value-of select statements, e.g. replace InputMessagePart_0 with $InputMessagePart_0. Pros: Looks tidy and easy to read. No need to construct the source message. Cons: The BizTalk XSLT map requires changes. Problem: If a BizTalk map has multiple target messages. Solution: The XSLT Transform will return an envelope message. 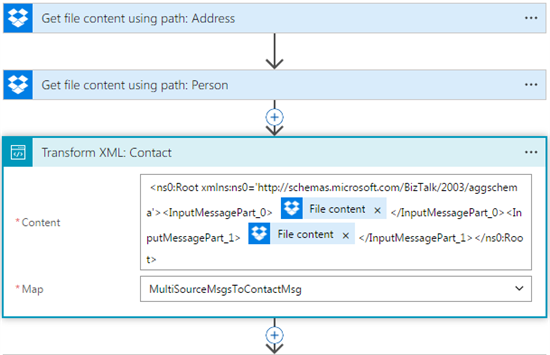 Use @XPath in Compose shapes to extract the target messages. The @xpath function returns an array. In order to reference the target message an index must be specified. For example, @xml(outputs('Compose:_PersonMsg')) (note that it is a zero-indexed array). Pros: The BizTalk XSLT map does not require changes. Cons: The target messages must be extracted using a Compose shapes and XPath queries. Solution: Modify the BizTalk XSLT map to return a JSON object that contains each of the target messages. base64 encode each target message. The response is parsed using a Parse JSON action. Pros: Looks tidy and easy to read. No need to extract the target messages. Cons: The BizTalk XSLT map requires changes. At present will not work with the Logic App XML Transform action. Problem: If a BizTalk map uses a Scripting functoid to call a common external assembly function(s). Solution: Migrate the external assembly function(s) to a new common XSLT file. Modify the XSLT to import the common XSLT file and call these script function(s) within the XSLT. <xsl:stylesheet xmlns:xsl="http://www.w3.org/1999/XSL/Transform" xmlns:msxsl="urn:schemas-microsoft-com:xslt" xmlns:var="http://schemas.microsoft.com/BizTalk/2003/var" exclude-result-prefixes="msxsl var s2 s1 s0 userCSharp" version="1.0" xmlns:s2="http://AzureBizTalkMapsDemo.Customer" xmlns:s0="http://AzureBizTalkMapsDemo/Person" xmlns:ns0="http://AzureBizTalkMapsDemo/Contact" xmlns:s1="http://AzureBizTalkMapsDemo/Address" xmlns:userCSharp="http://schemas.microsoft.com/BizTalk/2003/userCSharp"
"BadRequest. The 'Xslt' action failed due to incompatible map '<map name>'. Error details: 'An error occurred while processing map. 'XSLT compile error.''. "BadRequest. The 'Xslt' action failed due to incompatible map '<map name>'. Error details: 'Error(s) occured while compiling the Xslt. Error Details: https:// ....logic.azure.com/integrationAccounts/.../maps/import/ contents/Value?api-version=2015-08-01-preview&se=... : error CS1560: Invalid filename specified for preprocessor directive. Filename is too long or not a valid filename.'." The issue here is that the URI is longer than MAX_PATH or 260 characters (see https://msdn.microsoft.com/en-us/library/windows/desktop/aa365247%28v=vs.85%29.aspx?f=255&MSPPError=-2147217396). The second method is to create a URL shortening service that redirects to the CONTENT LINK URI. There are a number of examples on how to do this in Azure (e.g. see http://onthecloud.azurewebsites.net/personal-url-shortening-service-with-azure-storage). Use Azure API Management to publish a shorten URI to the XSLT file (see https://docs.microsoft.com/en-us/azure/api-management). Note: Testing an XSLT map in Visual Studio that include xsl:import or xsl:include elements, by right-clicking on the BizTalk map and selecting Test Map, will fail with the exception: XSLT compile error. Resolving of external URIs was prohibited. The XSLT must be tested by opening the XSLT file and selecting XML | Start XSLT Debugging from the Visual Studio menu bar. Pros: The Logic App XSLT Transform action can be used. Requires minimal changes to the BizTalk XSLT map. Cons: Will not work for functions that have parameter arrays or return arrays. Problem: If a BizTalk map uses a Scripting functoid to call an external assembly function. Solution: Migrate the external assembly function to a new Azure Function. Modify the BizTalk XSLT map to call the new Azure Function. 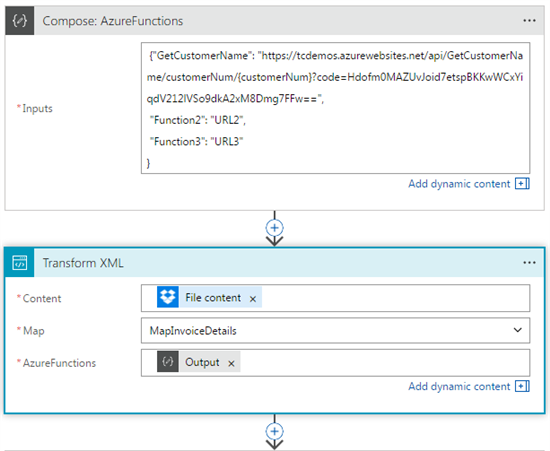 The following sample code demonstrates how to call an Azure Function from an XSLT map that is used within a Logic App Transform XML action. 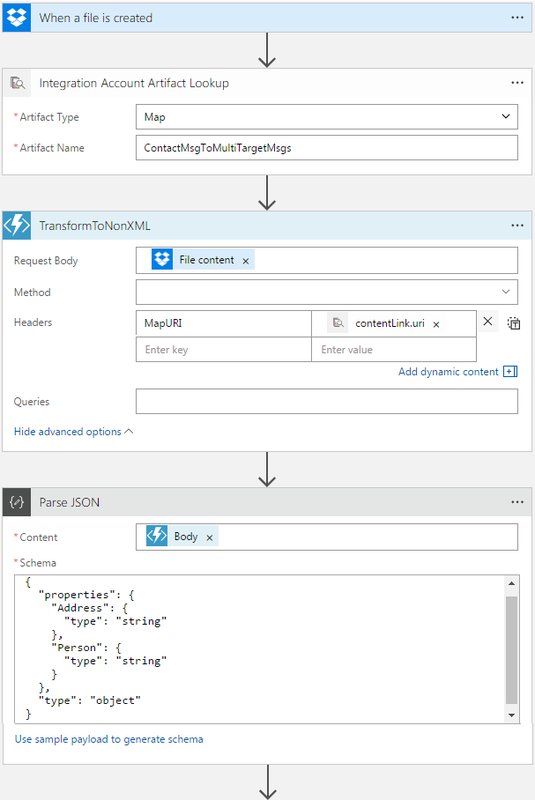 A JSON object containing a list of Azure Functions is passed as an xsl:param to the XSLT map. The list is deserialized into a IDictionary object. To call the desired Azure Function in the XSLT map a C# script method CallAzureFunction is invoked with the Azure Function name and any parameters that the function expects. The CallAzureFunction method looks up the Azure Function URL in the IDictionary and creates a WebRequest object to call the Azure Function. The response from the Azure Function is return to the calling XSLT script method. The script block does not support parameter arrays and any attempt to use them will result in the exception: System.Xml.Xsl.XslTransformException: Extension function parameters or return values which have Clr type 'String' are not supported. To overcome this add overload methods that take the desire number of parameters, concatenate the parameter into a comma separated string, and then pass the single parameter to the CallAzureFunction method. 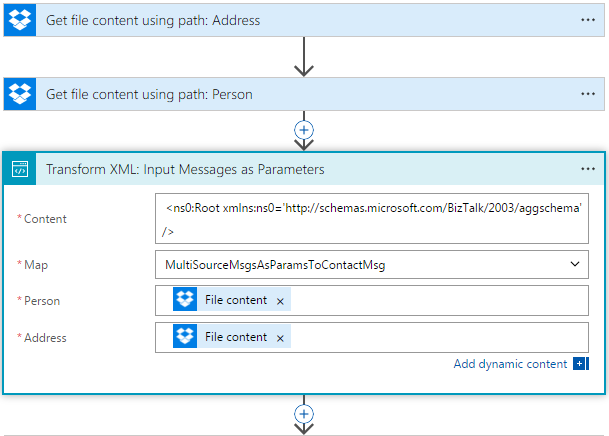 Upload the new XSLT map to the Azure Integration Account. Pros: The Logic App XSLT Transform action can be used. Will work for any function. Cons: Involves changes to the BizTalk XSLT map. Extra Logic Apps actions. An Azure Function has warm up time and a Consumption Plan has no SLA. The preceding six sections addressed common problems faced when trying to migrate a BizTalk map to a Logic App Integration Account and subsequently using that map in an XML Transform action, namely the "category 2" maps defined in section 2. Part 2 will focus on those maps ("category 3") which require a solution where the Logic App XML Transform action will not suffice, which could be due to the complexity of the map or simply because the XML Transform action is not available because there no Integration Account subscription.